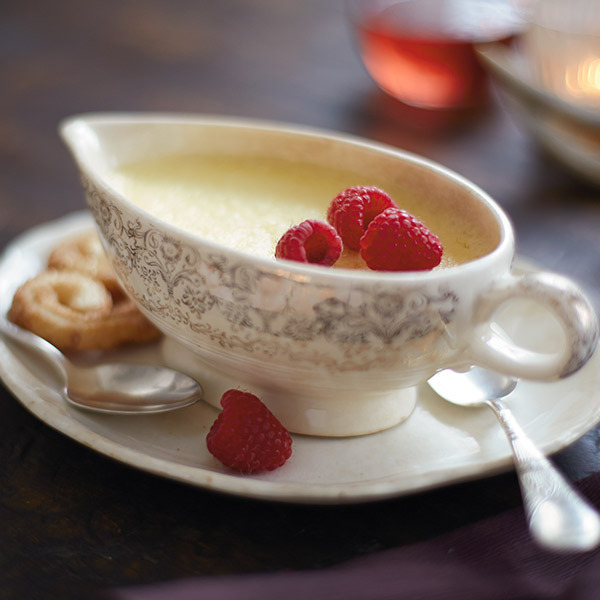 Put a lemony twist on traditional French custard with our luscious Lemon Pot de Crème recipe. Made with heavy cream, sugar and grated Meyer lemon zest, this creamy dessert for two is the perfect choice to cap off a romantic dinner at home. Garnish this delightful lemon custard with our easy puff pastry hearts and fresh raspberries. Preheat oven to 300°F. Have a teakettle with boiling water ready. In a small saucepan over medium-low heat, combine cream, milk, sugar, salt and lemon zest, and bring to a simmer. In a medium bowl, whisk together egg yolks. Then whisk in hot cream mixture. Whisk until well blended. Pour mixture through a fine mesh sieve into a 2-cup ramekin. Place filled ramekin into an 8-inch cake pan. Carefully pour boiling water into the cake pan until it reaches halfway up the outside of the ramekin. Cover the cake pan with foil and bake until custard is barely set, about 25 to 30 minutes. Custard should jiggle slightly in the center. Completely cool custard on wire rack, and then cover and refrigerate for at least 4 hours. While custard is chilling, make heart pastries. Preheat oven to 350°F and line a sheet pan with parchment paper. Roll out defrosted puff pastry dough, brush with melted butter, and sprinkle with sugar. Roll up the 2 opposite ends of the pastry until dough meets in the middle. Cut dough into 6, ¼-inch-thick pieces. Place on sheet pan and bake until golden brown, about 10 to 12 minutes. Cool for a few minutes on baking sheet, and then transfer to a wire rack. Serve chilled pot de crème with heart pastries and raspberries.